Dry eye syndrome is a disease and one of the most common and treatable ocular problems. If left untreated, Dry Eye Syndrome can be a progressive condition, leading to more serious consequences. Dr. Romanoff specializes in dry eye treatments that include medications and nutritional supplements to help our patients improve the quality of their lives as well as their vision. Dr. Romanoff has participated in national research in the field of dry eye syndrome and routinely evaluates all emerging research in the area of nutrition and eye health to enhance his patient's care. Dry eye syndrome is a condition that afflicts many people, especially women over 40. Some of the causes of dry eye syndromes are contact lens wear, aging, certain medical conditions such as thyroid and rheumatologic disease, as well as certain medications. When one has either watery eyes or eyes that feel dry and irritated, they most likely have dry eyes. Tears are produced by two different methods: First, and most important is a slow and steady basal rate of production which is mainly responsible for the lubrication of the eye. These basal tears consist of mucous, oils, and a watery type fluid. Second, is the reflex rate of tear production. 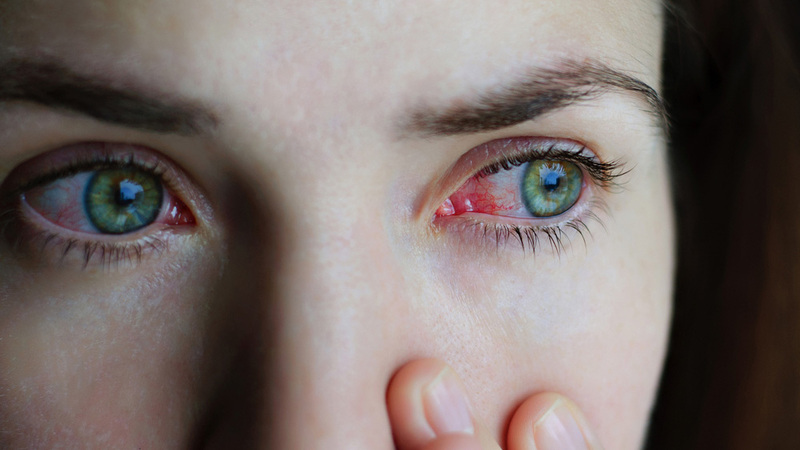 This type of tearing is caused by emotions, such as crying, or by physical irritation, which could be caused by getting a foreign object in the eye. The tear film that sits right on top of the cornea (the clear window of the eye) is a “sandwich” of mucous, water, and oil. Each component of the tear film is essential and all layers must be present in sufficient volume to ensure an adequate tear film. If any layer is inadequate or missing, dry eye syndrome will most likely appear. Even though the eyes are dry, the most common symptom is watery eyes. This sounds rather paradoxical however, when the brain senses even slight dryness and thus irritation, it signals the “crying” tear gland to produce tears in response to the irritation. Since most of these medications are necessary, artificial tears must be taken with them in order to feel comfortable. The treatment of dry eye syndrome depends on the cause and the severity of the condition. Typically most patients simply need to take artificial tears sold over the counter at all drug stores. There are many brands to choose from. There are many types of artificial tear of varying degrees of viscosity that one can use depending on how severe the symptoms are. Entry level therapy consists of regular artificial tears at least 4 times per day. The next level is artificial tear gel. This is also used at least 4 times per day. When neither of those types of artificial tears gives relief, the ophthalmologist will usually perform diagnostic tests in the office to determine what else might be needed for relief. Usually the ophthalmologist will start the patient on Cyclosporin A drops and/or oil/mucin type capsules taken orally. Both of these therapies will help the more difficult patients. When all oral and/or topical therapies still do not give relief, inserting tear duct plugs, to help preserve in the eye area the small amounts of tears present, seem to be of great relief to the most extreme dry eye patients. For more detailed information, please visit the American Academy of Ophthalmology (AAO) link.